I gave each child a sheet of light blue paper (9×11), a large dark blue rectangle (9×5.5) and a yellow circle (5″). We discussed the different colors, especially the 2 shades of blue, and glued the shapes together to match the cover of the book. We made a rainstorm by rubbing our fingers, then our hands, then patting our laps, then stomping our feet. Then the storm subsided by doing the actions in reverse order. 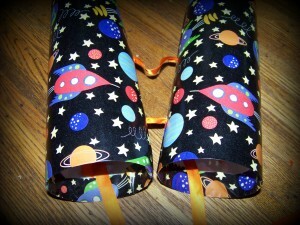 If you have rainsticks, you could bring those in for this activity as well. We used some of the Playing Ball activities on Pg 13 of Before Five in a Row and I passed out the story treasures. I filled a bin with leveling sand. On top I placed driftwood, beach glass, shells, feathers and rocks. They spent some time exploring including: digging in the sand, burying and finding treasures, comparing the rocks, and naming glass colors. My boys both love dress-up. 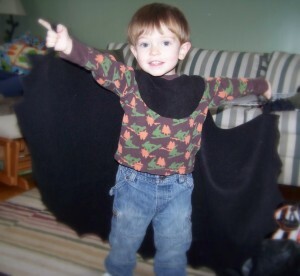 Recently they’ve been big into superheroes, so I knew this batman cape would be a hit. The best part is it only took about 20 minutes and cost under $3! I used a remnant* of black fleece purchased at Joanns. Lay the fleece out so that the fold is on the left. 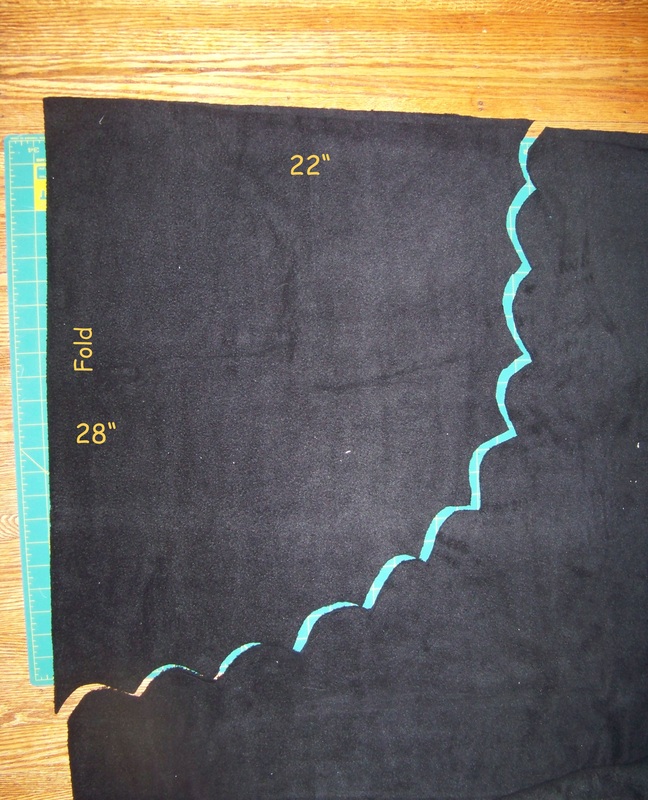 Measure 28″ down the fold and mark with a pin or soap. Along the top (selvage) edge measure and mark at 22″. 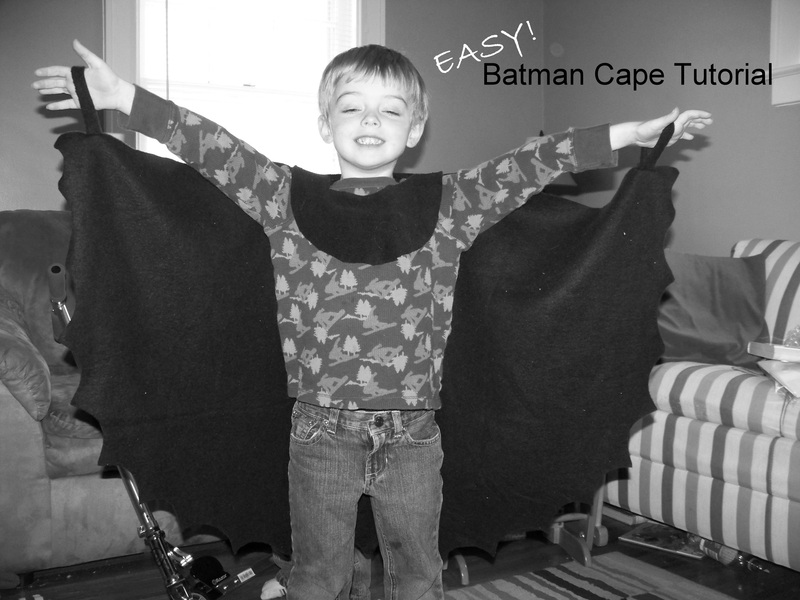 (So once opened the cape should be 44″ wide and 28″ long.) Cut scallops along an arc from one corner to the other. I traced with my finger a couple times before cutting. You could also mark it with a piece of white chalk or soap. 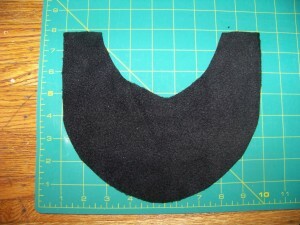 Cut an 8″ x 9″ rectangle for the collar. 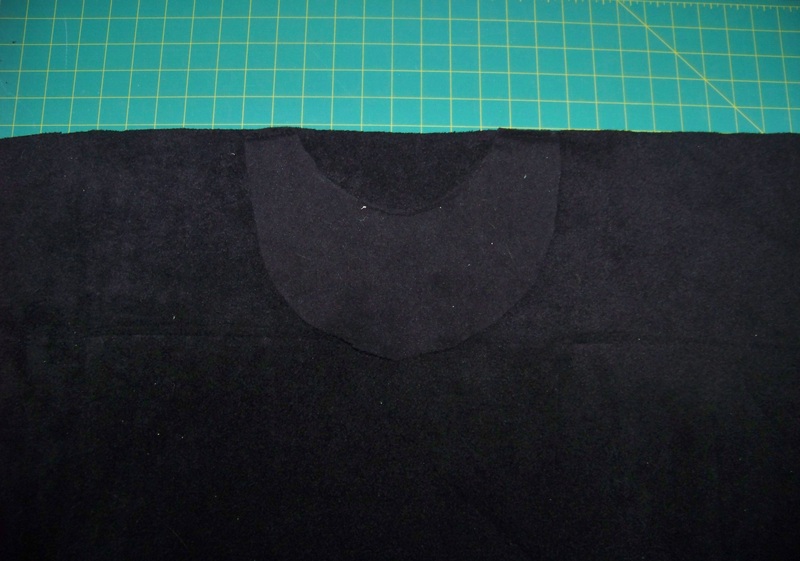 Fold in 1/2 so it’s 4.5″ x 8″. With the fold on your left, cut an arc from the bottom left corner to the top right corner. 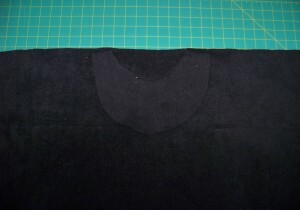 Now cut a smaller arc from 3″ down on the left side (fold) to about the middle of the top (selvage edge). With the cape open in front of you, lay the collar down centered so that the right sides of the fabric are against each other. 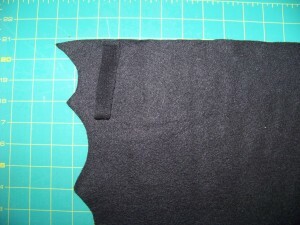 Sew (or glue) the 2″ strips where the collar touches the cape along the top edge. Cut 2 strips of fleece 1″ wide and 8″ long. 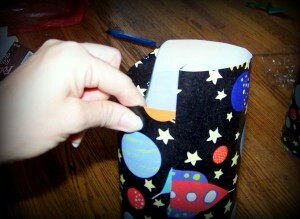 Fold one in 1/2 (wrong sides together) and sew or glue ends. Do the same with the other strip. Lay the cape open, wrong side up. Place the straps about 3-4″ in from each side, with the selvages edges lined up and the loop hanging down. Sew or glue in place. All Done! Little brother couldn’t resist trying it on, too! *At Joanns when there is less than 1 yd of fabric left on a bolt, it’s wrapped as a remnant and sold 50% off. The way remnants work is they are 50% off the current price, this means they are often cheaper than the price on the ticket. The wrapper around the remnant only shows the price if that kind of fabric is NOT on sale. This particular remnant was just shy of 1 yard. Regular price for a yard of anti-pill fleece is $9.99. It was on sale 50% off so the sale price is $4.99. Since it was a remnant it was 50% off the sale price, or $2.50 (75% off) can’t beat that! 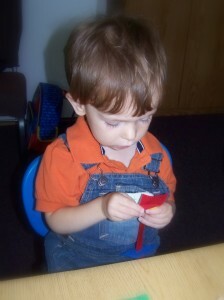 Last fall I taught a 2 & 3 year-old class at our local homeschool co-op. I used Before Five in a Row as my main curriculum, but added a few of my own ideas. I purchased or created a “story treasure” to go with each book we read. I created the lessons with centers in mind, where an adult helper is available to assist the children with whatever activity they chose. 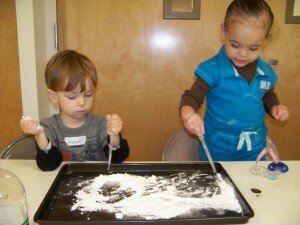 With a smaller class you could also do each activity together as a group. 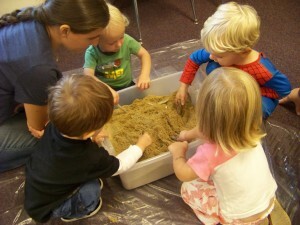 The children really enjoyed the class and my son still quotes and talks about the books, several months later. I hope you enjoy them as well! New Years resolutions…. you either love them or hate them. They can be a wonderful chance to evaluate your priorities and work to make positive changes in your life. The downside is that it can be very intimidating to keep those resolutions all the way to the end of the year. In fact, most resolutions don’t last past January. This year I’m trying something a little different, I’m setting monthly goals instead. Each month, our family will be sitting down together to write out 4 personal improvement goals: health, mental, self and spiritual. The chickenpox hit our house a couple weeks ago. Other than a day or two of feeling sick, I had a preschooler who was dying to play outside or with his friends, but was too contagious to leave the house for several days. 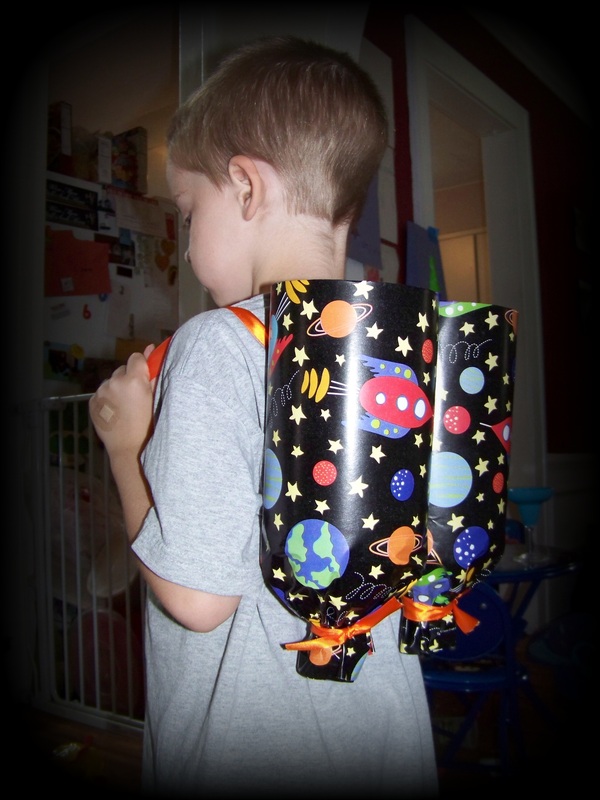 He’s been asking me if we could make a jet pack since we did the Outer Space Unit back in June… so I decided now was finally a good time. Here’s how we did it…. Carefully use the Exacto knife to cut off the bottom of the bottles. My helper also served as photographer when my hands were full…. I started by removing the label from the bottle. 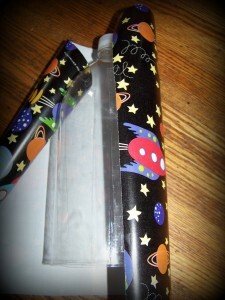 Then I taped one long edge of the paper to the bottle with regular tape (though packing tape would probably hold better). I wrapped the paper around the bottle and folded the raw edge down before taping that edge to the paper already taped to the bottle. Finally, I folded in the paper to cover the cut edge of the bottle and taped it securely inside. Repeat for the 2nd bottle. 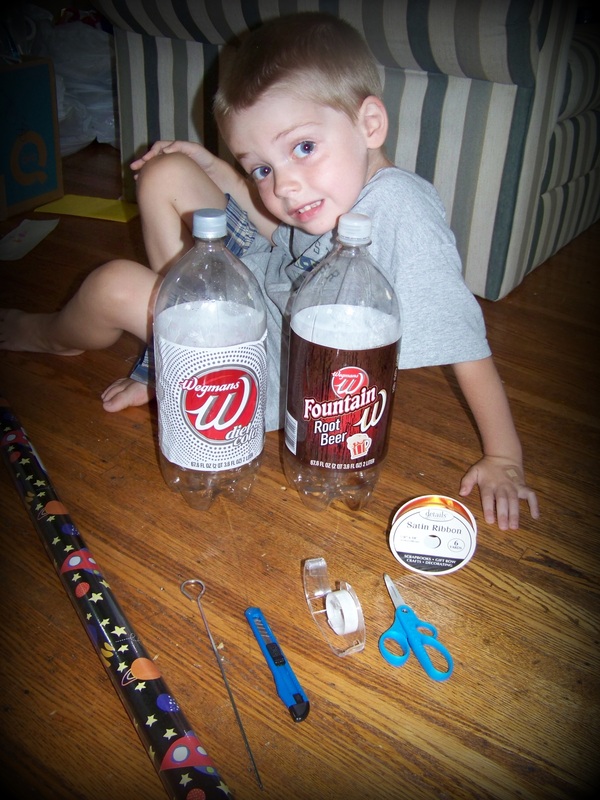 Using 2 lengths of ribbon, at least 12-15″ each, thread one end from the outside to the inside of the bottle. Since we poked the holes from the outside, going in it’s easiest to thread the ribbon the same way. I found it helped to cut the ribbon end at a 45 degree angle. Thread one ribbon through each top hole and the other ribbon through each bottom hole. 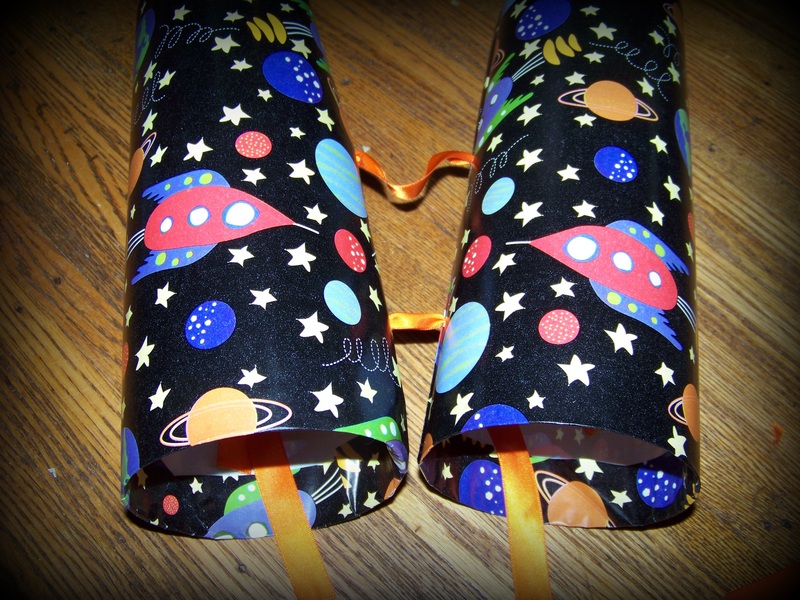 Pull the ribbons tight so that the bottles are up against each other, making sure the tails on each side are even. Now reach inside one bottle and tie the top ribbon to the bottom ribbon. I just used a double knot. 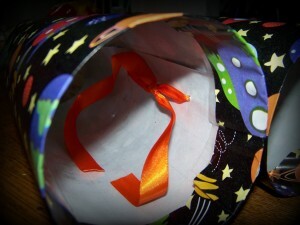 Do the same with the other bottle, being sure the ribbons are pulled taut. At this point my helper was much too excited to wait while I took pictures… but the next step should be easy enough. Using the metal skewer/ice pick/ scissors poke 2 holes in the back of each bottle, one near the top (before it slopes in) and one an inch or two up from the bottom. Now thread a ribbon 12-15″ long into the top hole, reach inside and tie a knot. 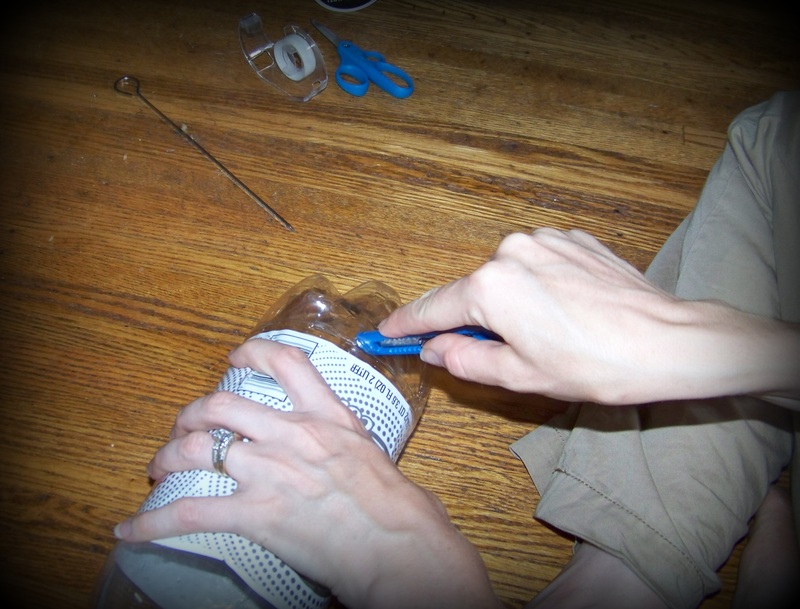 Thread the other end of that ribbon into the bottom hole of the same bottle and tie a knot inside the bottle. Do the same with the second bottle. 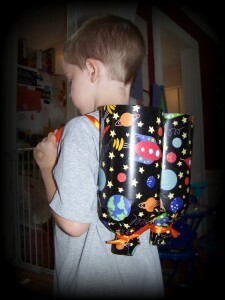 You may need to try on the jet pack and adjust the tightness of the ribbons for comfort. It took us a couple tries to find a length long enough that he could slip it on but tight enough that it didn’t move around too much when he ran. He’s modeling the jet pack upside down here, but didn’t want to take it off, lol. As a finishing touch, gather the wrapping paper around the neck of each bottle and tie ribbon to secure it. You could also tape some extra ribbon, streamers or tissue paper coming out the bottom of the jet pack as flames. If you used solid paper you may want to decorate it with stickers or add your child’s name. Be creative! 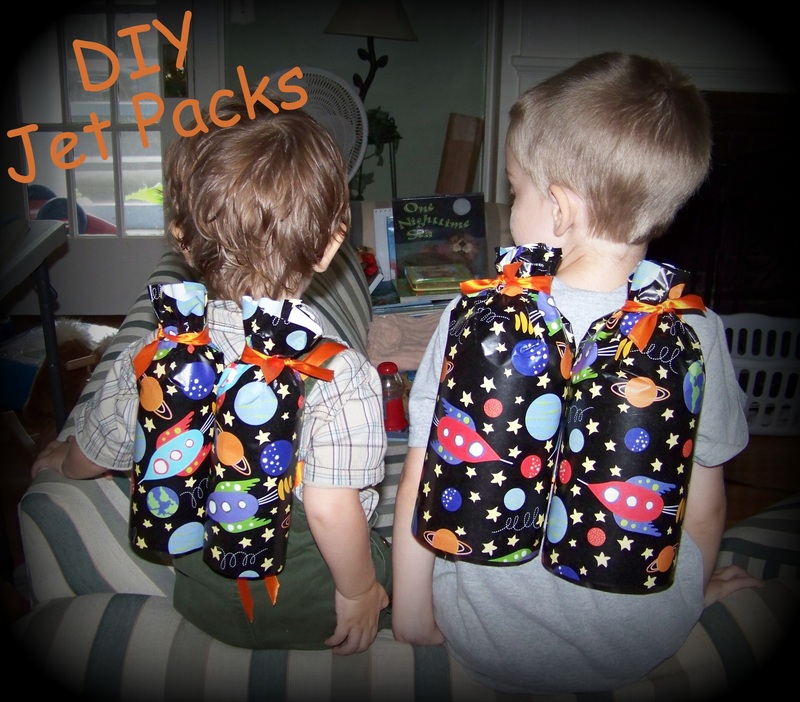 During the final stages of jet pack construction, Little Brother woke up from his nap and immediately wanted his own jet pack. We used 24 oz bottles to make his, but tying the ribbons inside was quite a bit more difficult. Even so, I think this size fits him much better. They had all kinds of fun jumping off the arm of the couch and “flying” onto the cushions! 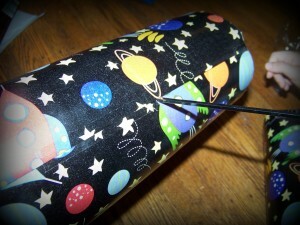 Since we used ribbon and wrapping paper from the dollar store, total cost was $2. Our last addition to the Ocean Lap Book was an Ocean Depth Zones Map. By this point he was tired of writing, so I created the map and labels on the computer. He drew an animal that lives in each zone, then glued the labels on the appropriate sections. Finished size 4″ x 9″, but it could easily be folded smaller. We’ve spent the month of July studying oceans. I knew I’m the Biggest Thing In the Ocean would be a hit, but we found a few other books, too. We borrowed this book from the library and I’m thinking we definitely need to purchase it. A giant squid swims around, comparing himself to other sea animals and declaring that he’s the biggest thing in the ocean. We’re introduced to a variety of fish, turtles, jellyfish, etc. before SURPRISE! a sperm whale swallows up the squid. Looking around the squid declares that he is, indeed, the biggest thing in this whale! We loved this book and read it many times throughout the unit. This counting book begins with 1 blue whale calf and counts up to 10 turtle hatchlings, then back down from 10 nimble basket stars to 1 brand-new seal pup. The pictures are torn paper collages and just beautiful. Older kids would probably enjoy creating their own ocean scene in this style. I loved that it included unusual creatures, like coral polyps, silky nudibranchs, and masked butterflies. The last couple pages of the book include more information about each of the sea creatures featured in the book. The kids loved the rhyming text, this is a book we enjoyed reading together several times! 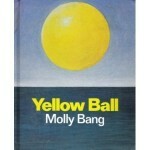 The companion to One Nighttime Sea, we found this book equally enjoyable. I really love the torn paper illustrations. We’re going to have to do an art project like that soon…. Each letter is represented by an underwater sea creature or plant in a rhythmic rhyme that my kids never tired of. We enjoyed the mixture of familiar animals as well as some unusual ones. Of course the last couple pages include a little more information about each animal mentioned in the book. Definitely planning to add both these books to our collection! This book would have been great to use for our “Ocean Depth Map.” The map we looked at had several animals for each level, which was a little overwhelming. Cat in the Hat only has 2-3 which would have been much more realistic for us to recreate. This was such a great book for opening circle! Even though I’m not much of a singer, I gave in and sang the song as I read through the book, per my son’s request. Sung to the tune of “Over in the Meadow” (which I’m not familiar with), the book counts from 1 to 10 as parents give direction to their offspring. lived a mother jellyfish and her baby jellies nine. This pictures book has very few words, but a powerful message. Two seals are playing ball in the ocean, when a 3rd seal appears on the beach. The books then explores 3 possibilities. The first is for one of the two playing to leave and play with the new friend. After showing how the left out seal would feel, the book asks “Or…” and provides another possibility. What if the two friends continued playing in the sea, ignoring the new seal on the beach? Of course that’s not any better so the final option is presented, all three seals playing together. While my almost-5-year-old is great at meeting and playing with new kids, this book was still an excellent dialogue for examining how each kid in a group feels. For a child who is struggling with excluding others, it would be even better! Usborne books are fantastic resources, and this book is no exception. This very informative book is a great reference. We didn’t read it straight through, but it provides some great pictures and details about a variety of sealife. by Bill Nye the Science Guy. There are 12 short lessons, each followed up with an experiment. Had I found this gem earlier I would have integrated some of these into our lessons. To go with our Ocean Unit this month our Friday Family Movie Night was Finding Nemo. I went all out with Ocean themed dinner, snacks and dessert. For dinner we had octopus hot dogs. I usually slice cooked hot dogs into long skinny sticks because they are one of the most commonly choked on foods. I’ve even cut them into this octopus shape before. However, if you cut them into the octopus and THEN boil them, the tentacles curl right up. Adorable! My toddler kept holding out his plate and announcing “cute!” We served the octopuses on a bed of Annie’s Organic Shells and Cheese. Yummy! 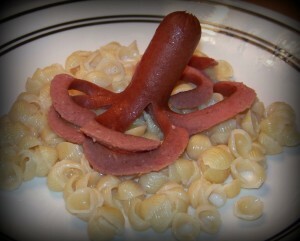 To make the octopus first lay a raw hot dog on it’s side and slice it longways about 2/3 of the way up. Roll the hot dog 90 degrees and cut again. Now you have 4 legs. Cut them each in half lengthwise to make 8. Bring a pot of water to boiling and drop them in. We enjoyed watching the octopuses “swim.” They only took a couple minutes to cook. We had fish tanks for our snack. 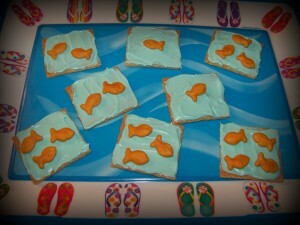 You’ll need graham crackers, vanilla frosting, blue food coloring and goldfish. The boys enjoyed helping me turn the frosting blue. It helps to transfer the frosting into a larger bowl before adding the food coloring, easier to get a consistent color. 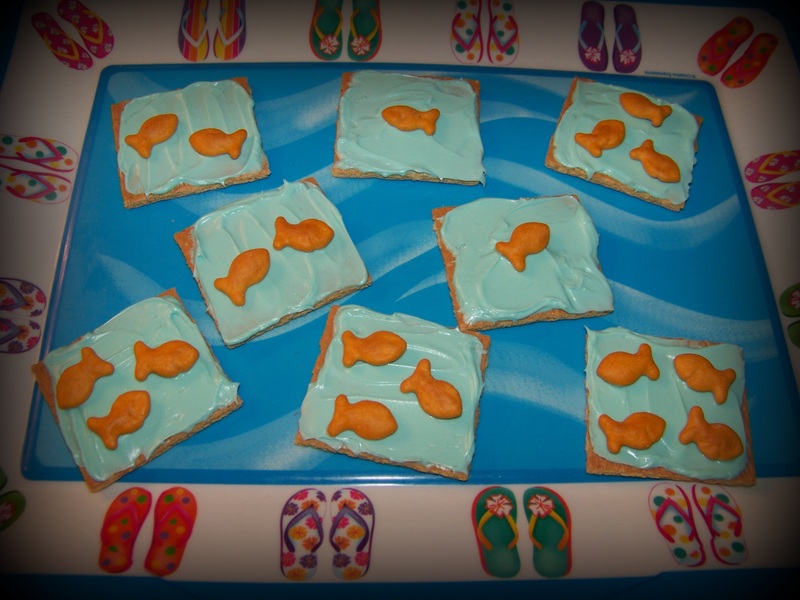 Once we were happy with our blue “water” we spread it on graham cracker halves. The boys took turns adding goldfish to the water, counting as we went. The combination of graham cracker, frosting and cheese was surprisingly good! You could also use Ritz crackers and cream cheese for a slightly healthier snack. Dessert should be made first, because it takes the jello awhile to set. We made blue raspberry jello and poured it into 1 cup size glass bowls. 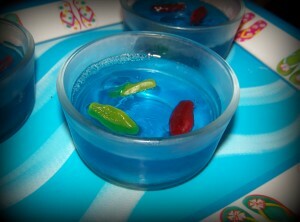 After it has chilled for about 20-30 minutes, add some gummy fish (swedish fish fall apart in the jello). We waited almost an hour and the jello was a little too set to add the fish, so they’re mostly on the surface. For those who haven’t seen the movie, it’s about an overprotective father clownfish and his adventurous son. While defying his father’s rules the son swims to the “dropoff” and is captured by a scuba diving dentist. Now the storyline is split between Nemo (the son) desperately trying to escape from the tank in the dentist’s office and his father (Marlin) trying to overcome his fears of the ocean to find his son. The beginning of the movie is what I was most concerned about. In normal Disney fashion, a parent has to die. In the first few minutes we see Marlin and his wife making a home and looking after their hundreds of eggs. When the mother and all the babies but Nemo are eaten, Marlin becomes very protective of Nemo. My sons handled the beginning much better than I had expected. They really enjoyed all the tropical sealife around the Great Barrier Reef and of course the turtles. The movie led to discussions of coral reefs, currents, and a wide variety of sea life. It was a great compliment to our Ocean Unit and some quality family time!